China’s automobile industry is planning an overhaul as slowing sales at home spur a boost in vehicle exports, which are up 75 per cent so far this year, compared with last year. China is hoping for a silver lining to the global financial crisis in the form of a chance to transform itself from a low-cost to a high-added-value economy. Some car market analysts think the country finally could be on the brink of realising its ambition to become the car factory to the world. As exports climb, some have begun to wonder if China could even pose a threat to global carmakers such as General Motors, Volkswagen, and Toyota in developed markets such as the US and Europe, or if it will remain stuck selling cheap cars to emerging markets. Sergio Marchionne, chief executive of Fiat and Chrysler, recently admonished global carmakers to take China’s ambitions seriously. The push by Chinese carmakers for increased sales “in markets outside China is gaining momentum”, says Namrita Chow of IHS Automotive in Shanghai. 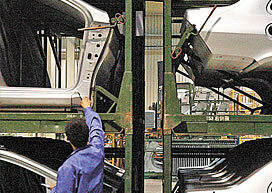 Chery, a leading state-owned carmaker, has so far this year boosted exports by more than 80 per cent from last year. It plans to build a $400m factory to assemble cars in Brazil as well as production facilities elsewhere in Latin America. Chinese carmakers JAC and Lifan both have ambitious plans for overseas expansion and truckmaker Beiqi Foton intends to build a plant in India. But while excess capacity at home will drive Chinese carmakers to export, analysts say that will not necessarily guarantee success in markets beyond their current mainstays of Latin America, the Middle East and Russia. “Until ‘Made in China’ can attract more affluent Chinese buyers, it’s unrealistic to expect that [Chinese carmakers] can win over more experienced and discerning consumers in the more mature markets,” says Bill Russo of Synergistics auto consultancy in Beijing, former head of Chrysler in China. Even the recent sharp rise in exports is deceptive, says Yale Zhang of Auto Foresight, adding that exports are merely recovering from an artificially low base hit amid the 2008 global financial crisis. Most analysts agree that the main force behind the current export boom is that Chinese carmakers are struggling to maintain rapid sales growth in the face of weakening domestic demand. They are even losing market share to the global OEM’s (original equipment manufacturers) during the slowdown. But any worries of a serious pick-up in competition for global carmakers from Chinese rivals – at least in developed markets – are probably premature. “Even in the domestic market, Chinese cars cannot compete with European and American cars, not to mention in the US and European markets,” says Zhang Junyi of Roland Berger in Shanghai. Even in emerging markets, the Chinese OEMs are facing intensifying competition in overseas markets from European, American and Japanese carmakers struggling to diversify away from their own slow-growing home markets. “In the long term, success abroad will have to build on success at home,” says Klaus Paur of Synovate, a Shanghai auto consultancy.